Prime Minsiter Nawaz Sharif on Tuesday said Pakistan cannot be bullied by Indian "tactics" and its restraint should not be "misunderstood" as weakness, warning that his country was fully capable of defending against "any belligerence". His remarks came a day after the Pakistan Army admitted that seven of its soldiers were killed in firing by Indian troops across the Line of Control in Bhimber sector. "Pakistan cannot be bullied by such tactics as we are fully capable of defending our soil against any belligerence," Sharif said while chairing a high-level meeting to review the situation along the LoC. He said Pakistan was exercising "maximum restraint" in the face of Indian firing, which should not be "misunderstood as our weakness," The Express Tribune reported. Expressing grief over the death of the seven soldiers, Sharif said deliberate escalation of tension along LoC by Indian forces is a threat to regional peace and security. "It is also a futile attempt of the Indian authorities to divert the world's attention from the worst kind of atrocities they are committing" in Kashmir, he said in a statement. He called on the United Nations to take notice of the ceasefire violations along the LoC. 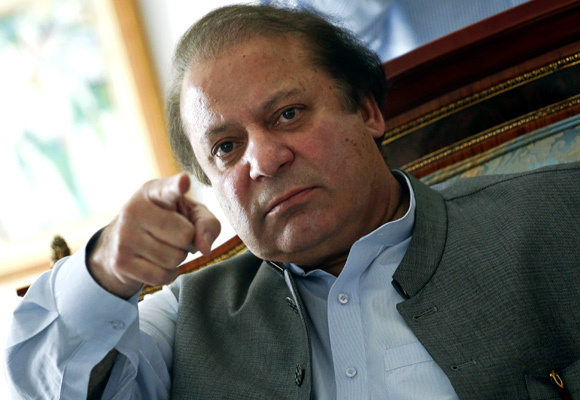 "Our armed forces do not initiate fire but will always respond in a befitting manner to any aggression," Sharif said. On Monday, Army chief General Raheel Sharif ordered troops to "effectively" respond to firing by India across the LoC. Earlier, Adviser to the Prime Minister on Foreign Affairs Sartaj Aziz briefed Nawaz Sharif on the increased firing and shelling by India. He said the recent incidents of firing have led to 26 deaths and 107 injuries in complete violation of the 2003 ceasefire understanding and international law. The premier was also briefed on Pak-US relations in the backdrop of recently held presidential elections in the US. Reaffirming to strengthen bilateral relations, Sharif said Pakistan and the US enjoy strong and strategic partnership spanning over a period of seven decades. "Pakistan looks forward to closely work with the newly elected government for realisation of peace, security and prosperity in the region and beyond," he said. Pakistan's National Security Adviser General Nasir Khan Janjua and other government officials were present during the meeting.